While most people do not really like the idea of being turned to stone, you might want to brave up and try to take a look at Medusa because in the Medusa Scratch game you have a chance of winning some money if you are able to appease this fearsome Greek monster. 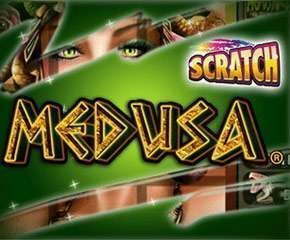 Medusa Scratch has been developed by the NextGen gaming company, which has been entertaining online casino players for years now and has recently been developing games like this one especially for mobile. The game is great to play and features some very realistic graphics that only serve to add to the eerie effect of the myth. Medusa Scratch is a 3 x 3 scratch card game made about the titular character, who is a monster according to Greek mythology. Medusa was said to be a fearsome creature who had a head of snakes and a face so scary that anyone who looked at her face would be turned into stone. In the game, you are on her side so she will spare you if you can appease her by finding some cash along the way. To start playing, you will have to set a bet and then click the Play button to see three cards appear on the game screen. You can then scratch at these cards to see what symbols you get so that you can see if you have won something or not. If you get three matching symbols, you are said to have won. What you win depends on which symbol you get three of, as different symbols have different bet multipliers attached to it. 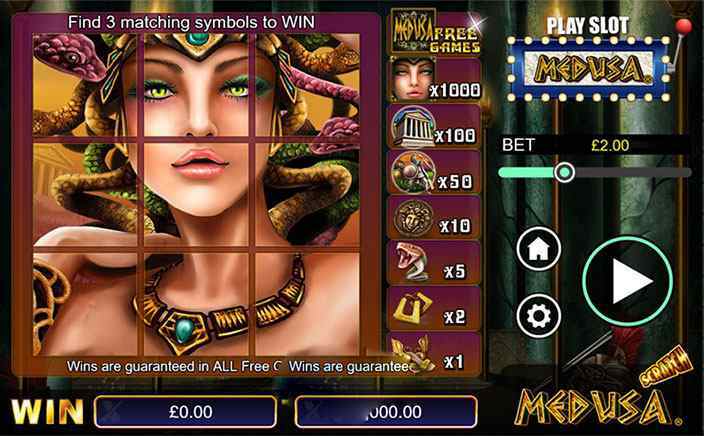 The highest that you can win in the game is through the Medusa game icon which pays out 1000x your bet. The lowest that you can in on the game is through the sign of the footwear, which pays out just 1x your bet amount. Other symbols you can look forward to are the snakes, ancient Grecians buildings, shields, medals and gold ornaments. As far as match to win games go, Medusa Scratch offers you the same chances of winning as any other and the same sort of limited features. The eerie symbolism as you help Medusa catch some unsuspecting victim to turn to stone all help to make the game very interesting to play, even if it has a sinister undertone. As long as this monster is on your side, you can make it out of the game safe and sound and even manage to pocket some cool wins if you are lucky enough to get the right cards on the screen.